There's a playable demo out today for Army of Two: The Devil's Cartel on Xbox 360 and PlayStation 3. The 1.64GB demo gives you a chance to check out the game's two player online or couch co-op action as you drop into the shoes of the two new protagonists - Alpha and Bravo. Pure co-op is back! Army of TWO™ The Devil’s Cartel delivers a fun, over-the-top co-op experience. Activate the new Overkill mode to unleash explosive destruction on a lethal Mexican drug cartel. Experience the full action-blockbuster campaign in local split-screen or online co-op! You can queue up the Xbox 360 demo right here. The PSN version should be up after the store updates later today. Don't forget to check out our hands on time with the game from a few weeks back. 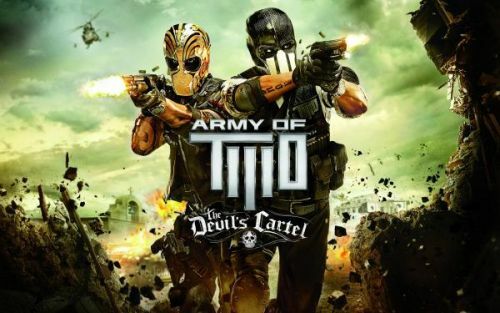 Army of Two: The Devil's Cartel will be out on March 26th on Xbox 360 and PlayStation 3. It features split-screen couch co-op and online co-op for two players through the campaign.